Flo Black detergent is innovative product to remove stains from black and dark fabrics. It contains new high qualitative active ingredients. With its effective formula it gently cleans and cares for your clothes while preventing colour fading. It is not irritating to skin which was approved by dermatological tests. It contains natural cotton ingredients. Flo Black leaves a delicate and pleasant floral-fruity scent of apple and jasmine with a long-lasting effect. The specifically developed formula promises a highly effective outcome and removes even stubborn stains. It is suitable at high and low temperatures. 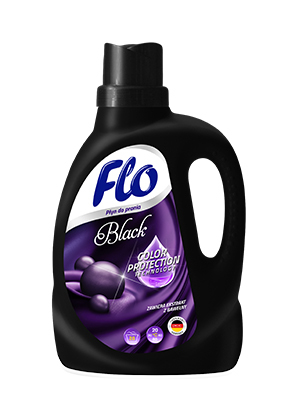 Flo Black Liquid Detergent is suitable for both machine and hand washing. It contains no phosphates or parabens. The formula was created on the basis of specially selected high quality raw materials, including biodegradable surfactants. The product contains environmentally friendly ingredients. New production installations on which the product is manufactured meet the standards of ISO 4001 and ISO 9001 within the framework of the certified Quality Management system. Ingredients: 5-15% anionic surfactants, < 5% soap, < 5% EDTA and its salts, < 5% preservatives (Benzisothiazolinone, Methylisothiazolinone), < 5% Fragrance composition. Garment care instructions, in particular with regard to washing temperatures, should be used. When washing new clothes for the first time, it is recommended to wash them separately. Do not wash dark fabrics with bright and white colors. Mix the liquid thoroughly with water before immersing the fabric.